When St. Mary’s Professor of International Relations, Larry Hufford, Ph.D., is not teaching, he spends much of his time working with several international peace research and peace education organizations. His international involvement and expertise has resulted in invitations from universities around the world, inviting Hufford to deliver lectures. In past years, Hufford has been invited to lecture at universities in Australia, Hong Kong, Thailand, Bangladesh, Mexico, England, Spain, Taiwan and Sweden. “I have considered myself first and foremost a peace educator,” Hufford said. 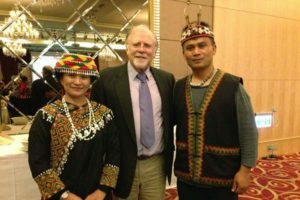 Hufford is the former president of the International World Council for Curriculum and Instruction and was the keynote speaker at the 2014 World Council for Curriculum and Instruction (WCCI) Taiwan Chapter Conference in Taipei, Taiwan in late September. His speech addressed the problems and possibilities in the multicultural and global education in the international societies. 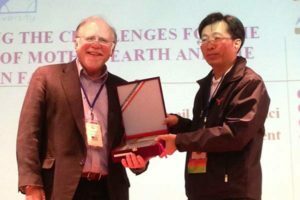 After his keynote presentation for WCCI, Hufford traveled to Kaohsiung where he delivered two lectures to graduate students at the National Kaohsiung Normal University, all expenses paid.